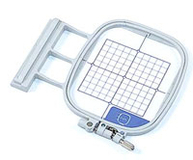 Embroidery Hoops, Attachments and accessories to fit the Brother Innovis 1500 series. Brother Embroidery Frame EF81 Extra Large. The Extra Large Embroidery Frame..